Hearthfire Creatures — New creatures added by the add-on. 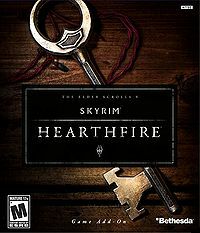 Hearthfire Items — New items added by the add-on, including apparel, books, building materials, weapons, and more. Hearthfire NPCs — New NPCs added by the add-on. Hearthfire Quests — Quests added by the add-on. Construction — Details on building your home. Furnishing Options — A list of pages detailing the furnishing options for each part of your home. 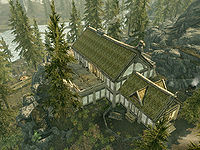 Heljarchen Hall — Located in the Pale, this plot of land may be purchased from the Jarl of Dawnstar in the White Hall. You will have to complete the quest Waking Nightmare, and then the favor quest Kill the Giant before being allowed to purchase the property if Skald is still jarl. (Note: This favor has a prerequisite of being level 22.) If you are thane of the hold, you will be appointed a housecarl named Gregor. It is located in the south of the Pale, not far north of Whiterun; the closest landmarks are the Tower of Mzark, Loreius Farm and Blizzard Rest. Esta página foi modificada pela última vez à(s) 02h46min de 8 de dezembro de 2015.